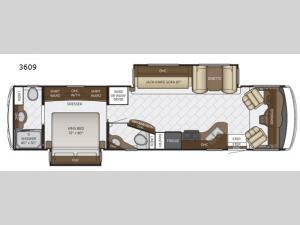 You will enjoy all of the room throughout this double slide out Bay Star 3609 class A motor home. Mid-coach there is a convenient half bathroom and in the rear you will find a master bathroom with a 40" x 30" shower. Come relax in the front living area where you will find an 87" jack-knife sofa and across the room there is a dry bar with a TV above. In the bedroom you can get a good night's rest on the king bed. There is also plenty of storage with the two shirt wardrobes and large dresser!